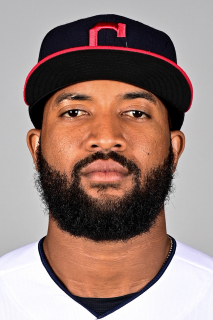 Domingo Alberto Santana…resides in Santo Domingo, Dominican Republic… grew up and learned to speak English in St. Thomas of the U.S. Virgin Islands…his father, also named Domingo, was an outfielder/pitcher in the Astros minor league system. The Totals - Hit .265 (56x211) with 21 runs, 14 doubles, 5 home runs and 20 RBI in 85 games with the Brewers...In a Pinch - As a pinch-hitter, hit .414 (12x29) with 5 doubles, 2 home runs and 5 RBI…his .414 average is tops among Brewers pinch-hitters in club history and ranked 2nd in the Majors in 2018 (Colin Moran-PIT, .423/11x26)...Goodbye Baseball - Belted pinch-hit home runs on Sept. 16 vs. Pittsburgh and Sept. 17 vs. Cincinnati…was 1 of 2 players in the Majors last season to record pinch-hit home runs in back-to-back team games (also: José Briceño-LAA)...A Minor Thing - Optioned to Triple-A Colorado Springs on June 23, where he hit .283 (53x187) with 30 runs, 10 doubles, 2 triples, 8 home runs and 35 RBI in 55 games...Welcome Back - Recalled by Milwaukee on Sept. 1…hit .409 (9x22) with 3 doubles, 1 triple, 2 home runs and 3 RBI over his last 23 games…of his last 23 appearances, 21 came as a pinch-hitter; hit .444 (8x18) with 2 home runs and 3 RBI in that role from Sept. 1 on...Postseason Report - Appeared in all 10 of the Brewers postseason games: 3 in the NLDS vs. Colorado and 7 in the NLCS vs. Los Angeles-NL…was used exclusively as a pinch-hitter and went 2-for-8 with 1 double, 3 RBI and 2 walks. Batted .278 with 30 HR, 85 RBI and 15 stolen bases in 151 games... Made 139 starts (138g in RF).....also made another start on 8/6 at Tampa Bay but never took the field after being hit by a pitch in the top of the first inning (was scheduled to play RF)... Led the team in batting average (.278), runs (88) and on-base percentage (.371)... Ranked second on the team in hits (146), doubles (29), RBI (85) and total bases (265), trailing only Travis Shaw in those categories... Ranked second on the team in walks (73) and OPS (.875), trailing only Eric Thames...Was one of the most productive right fielders in the National League as he ranked among the leaders from that position in stolen bases (T1st, 15), walks (2nd, 73), total bases (2nd, 259), on-base percentage (2nd, .372), HR (T2nd, 29), extra-base hits (T2nd, 57), RBI (3rd, 83), hits (3rd, 144), runs (3rd, 87), batting average (3rd, .276) and OPS (3rd, .873)... Smacked his first career grand slam (off Patrick Corbin) in a 9-5 win on 5/28 vs. Arizona • Had a pair of career-high 9-game hitting streaks (6/1-6/9 and 9/9-9/21)...Was named Brewers Player of the Month for September/October (24g, .301, 8hr, 19rbi). Batted .256 with 11 HR and 32 RBI in 77 games.....made his first career Opening Day roster...Made 62 starts (57g in RF, 3g in LF, 2g in CF)...Hit a ninth-inning homer off Trevor Rosenthal on 4/13 at St. Louis, giving the team a 6-4 win ...Smacked his first career leadoff homer on 5/1 vs. Miami off Tom Koehler...Was on the 15-day disabled list from 5/20-6/2, retroactive to 5/19, with right shoulder soreness...Was on the 15-day disabled list from 6/10-8/18, retroactive to 6/8, with right elbow soreness...Batted .301 (28-for-93) with 7 HR and 17 RBI over his last 24 games...Produced the first multi-homer game of his career on 9/4 at Pittsburgh (2hr)...Played for Licey in the Dominican Winter League. Began the season in the Astros organization, where he batted .320 with 16 HR and 59 RBI in 75 games at Triple-A Fresno.....was recalled by Houston on 6/16…Batted .256 with 2 HR and 8 RBI in 14 games with the Astros (6/16-7/3)…Made 10 starts (8g in RF, 2g in LF)…Was traded to Milwaukee as part of a six-player deal on 7/30…Batted .380 with 2 HR and 18 RBI in 20 games at Triple-A Colorado Springs…Was recalled by Milwaukee on 8/21…Batted .231 with 6 HR and 18 RBI in 38 games with the Brewers…Made 34 starts (21g in CF, 13g in RF)…Had career highs with 3 hits, including a homer, and 5 RBI in a 9-7 loss on 9/19 vs. Cincinnati..Combined at Fresno and Colorado Springs to hit .333 with 18 HR and 77 RBI in 95 games to earn a spot on the All-Pacific Coast League Team.....was also named the 13th-best prospect in the PCL by Baseball America…Following the season played for Licey in the Dominican Winter League. Played in six games for Houston, making three starts in left field and two in right field in what was his Major League debut...began the year with Triple A OKC before being recalled to Houston on July 1...started that night vs. SEA in left field, going 0x4 with a run scored...optioned to OKC on July 5...had his second and final stint with the Astros from Aug. 3-12...played the majority of his season with OKC and was named the Team MVP after leading the club with 81 RBI, 16 home runs, 27 doubles, and 45 extra-base hits...set a career high with 64 walks to lead the team...also named an MiLB.com Organizational All-Star...selected to the 2014 Sirius XM All-Star Futures Game, going 0x2 with a strikeout and groundout in the contest...prior to the season, was ranked as the Astros No. 8 prospect by Baseball America...finished the season tied for fifth in the PCL in walks and ranked seventh in OBP (.384)...ranked second on the team with both 131 hits and 63 runs...led the team with 36 multi-hit games...recorded the most RBI in a season by a RedHawk since 2008...led the team with 19 multi-RBI games...batted .364 with runners in scoring position, including .380 with two outs...named RedHawks Player of the Month for May...batted .297 and led the team in hits (33), runs (16), homers (6), and tied for most RBI (16) in the month...had one walk-off homer this season, a three-run shot to beat Omaha 8-5 on June 27...following the regular season, played for Licey in the Dominican Winter League, posting a .284 average (31x109) with five RBI in 36 games. Spent the entire year at Double A Corpus Christi where he was a Texas League Midseason All-Star despite being the second-youngest player in the league...hit 25 homers, becoming the youngest Astros minor leaguer ever to hit 25+ homers at the Double A level...ranked third in the league in homers, tied for third in extra-base hits (50) and fourth in OPS (.842)...homered once every 16.64 at-bats, which ranked third in the league...hit .252 (105x416) and added 23 doubles, 64 homers and a .498 slugging percentage... hit .294 (25x85) with a .553 slugging percentage against lefties but hit 20 of his 25 homers against righties ... faced pitchers that were older than him in all but three of his plate appearances ... homered three times in the same game on May 10 vs. Frisco, going 3x4 with five RBI...also had a multi-homer game during the final contest of the regular season on Sept. 2 vs. San Antonio (3x4, 2 HR, 4 RBI)...prior to the season, was ranked by Baseball America as the No. 11 prospect in the Astros system...following the season, was tabbed by BA as the No. 6 prospect in the Texas League ... played for the Tigres del Licey in the Dominican Winter League this offseason...hit .244 (11x45) with three doubles, two homers and six RBI in 17 games. Began the year with Class A Lakewood before getting traded to the Astros on Aug. 15...closed out the season at Class A Lexington...combined to hit .287 (120x418) with 33 doubles, four triples, 12 homers, 53 RBI and a .362 on-base percentage in 113 games between Lakewood (96g) and Lexington (17g)...rated by Baseball America as the No. 9 prospect in the Phillies system and the No. 18 prospect in the South Atlantic League. Combined to hit .211 (74x351) with 19 doubles and eight homers in 103 games between Class A Short Season Williamsport (54g) and Class A Lakewood (49)...was ranked by Baseball America as the No. 10 prospect in the Phillies system and the No. 12 prospect in the New York-Penn League. In his first professional season, hit .288 (34x118) with six homers, 28 RBI and a .388 on-base percentage in 37 games with the Gulf Coast League Phillies...ranked tied for fourth in the GCL in homers...was named the Phillies Minor League Player of the Month for August...following the season, was ranked by Baseball America as the No. 10 prospect in the Phillies system. December 21, 2018 Milwaukee Brewers traded RF Domingo Santana to Seattle Mariners for LF Ben Gamel and RHP Noah Zavolas. December 20, 2018 Tigres del Licey placed OF Domingo Santana on the reserve list. December 4, 2018 OF Domingo Santana assigned to Tigres del Licey. September 1, 2018 Milwaukee Brewers recalled RF Domingo Santana from Colorado Springs Sky Sox. June 23, 2018 Milwaukee Brewers optioned RF Domingo Santana to Colorado Springs Sky Sox. May 3, 2018 RF Domingo Santana assigned to Colorado Springs Sky Sox. August 19, 2016 Domingo Santana roster status changed by Milwaukee Brewers. August 15, 2016 RF Domingo Santana assigned to Colorado Springs Sky Sox. July 23, 2016 Milwaukee Brewers sent RF Domingo Santana on a rehab assignment to Wisconsin Timber Rattlers. June 10, 2016 Milwaukee Brewers placed RF Domingo Santana on the 15-day disabled list retroactive to June 8, 2016. Right elbow soreness. June 3, 2016 Milwaukee Brewers activated RF Domingo Santana from the 15-day disabled list. May 31, 2016 Milwaukee Brewers sent RF Domingo Santana on a rehab assignment to Biloxi Shuckers. August 21, 2015 Milwaukee Brewers recalled RF Domingo Santana from Colorado Springs Sky Sox. August 2, 2015 Milwaukee Brewers optioned RF Domingo Santana to Colorado Springs Sky Sox. July 30, 2015 Milwaukee Brewers traded CF Carlos Gomez, RHP Mike Fiers and Other Considerations to Houston Astros for RHP Adrian Houser, OF Brett Phillips, RF Domingo Santana and LHP Josh Hader. July 5, 2015 Houston Astros optioned LF Domingo Santana to Fresno Grizzlies. June 16, 2015 Houston Astros recalled Domingo Santana from Fresno Grizzlies. March 13, 2015 Houston Astros optioned LF Domingo Santana to Fresno Grizzlies. August 13, 2014 Houston Astros optioned Domingo Santana to Oklahoma City RedHawks. August 3, 2014 Houston Astros recalled Domingo Santana from Oklahoma City RedHawks. July 6, 2014 Houston Astros optioned LF Domingo Santana to Oklahoma City RedHawks. July 1, 2014 Houston Astros recalled Domingo Santana from Oklahoma City RedHawks. March 10, 2014 Houston Astros optioned RF Domingo Santana to Oklahoma City RedHawks. November 21, 2013 Houston Astros selected the contract of Domingo Santana from Corpus Christi Hooks. August 28, 2013 Domingo Santana roster status changed by Corpus Christi Hooks. August 18, 2013 Corpus Christi Hooks placed RF Domingo Santana on the 7-day disabled list. April 26, 2013 Corpus Christi Hooks activated RF Domingo Santana from the 7-day disabled list. April 18, 2013 Corpus Christi Hooks placed RF Domingo Santana on the 7-day disabled list. April 1, 2013 RF Domingo Santana assigned to Corpus Christi Hooks from Lancaster JetHawks. March 16, 2013 RF Domingo Santana assigned to Houston Astros. June 10, 2012 Domingo Santana roster status changed by Lancaster JetHawks. June 4, 2012 Lancaster JetHawks placed RF Domingo Santana on the 7-day disabled list. April 16, 2012 Lancaster JetHawks activated RF Domingo Santana from the 7-day disabled list. April 6, 2012 Lancaster JetHawks placed RF Domingo Santana on the 7-day disabled list. April 3, 2012 RF Domingo Santana assigned to Lancaster JetHawks from Lexington Legends. October 14, 2011 OF Domingo Santana assigned to Tigres del Licey. August 15, 2011 Lakewood BlueClaws traded RF Domingo Santana to Lexington Legends. April 2, 2011 Domingo Santana assigned to Lakewood BlueClaws from Williamsport Crosscutters. September 23, 2010 Domingo Santana roster status changed by Williamsport Crosscutters. September 3, 2010 Williamsport Crosscutters placed RF Domingo Santana on the 7-day disabled list. June 15, 2010 RF Domingo Santana assigned to Williamsport Crosscutters from Lakewood BlueClaws. April 5, 2010 Domingo Santana assigned to Lakewood BlueClaws from GCL Phillies. June 23, 2009 Philadelphia Phillies signed OF Domingo Santana. June 23, 2009 Domingo Santana assigned to GCL Phillies.